Another way of comparing commitment to public agricultural R&D investment across countries is to measure intensity (Map 2)—that is, total public agricultural R&D spending as a percentage of agricultural output (AgGDP). Overall investment levels in most countries are still well below the levels required to sustain agricultural R&D needs. 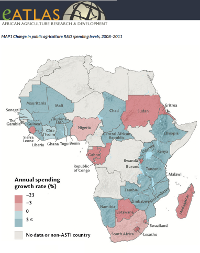 In 2011, SSA as a whole invested 0.51 percent of AgGDP on average. Just 10 of the 39 countries met the investment target of one percent of AgGDP set by the African Union’s New Partnership for Africa’s Development (NEPAD). Some of the smallest countries in Africa, such as Lesotho, Swaziland, Burundi, Eritrea, and Sierra Leone, have such low and declining levels of investment that the effectiveness of their national agricultural R&D is questionable. In addition, compared with other developing regions, agricultural R&D is highly dependent on funding from donor organizations and development banks such as the World Bank (Figure 1). This type of funding has been highly volatile over time, leaving research programs vulnerable and making long-term planning difficult.